Image: Brazilian politicians livestreaming while campaigning and breaking a Marielle Franco sign. Current Rio governor on the right and a now-elected deputy breaking the sign. As mobile phone access and Internet bandwidth increased in this decade, video streamings became an important part in the political dispute: such as in the beginning with the Arab Spring, the Occupy movement in the USA, the indignados movement (15-M) in Spain or the 2013 protests in Brazil. We have many examples around the world about how video and amateur live streamings in social networks transformed activist and democratic practices, protests and methodologies to document human rights violations. Seeing the potential in this area has driven much of WITNESS’ work around livestreaming and co-presence including the Mobil-Eyes Us project. However, currently, these same tools are being used politically to promote hate speech, attacks against human rights defenders and progressive activists. WITNESS has been covering this topic since the start and have followed some of these experiences globally. In this essay, we will analyze these shifts, reviewing recent aspects of the political use of video and live streamings in Brazil, more specifically, Rio de Janeiro. Since the beginning of this decade, live streaming via web has been used widely to denounce abuses or human rights violations in Rio de Janeiro, especially after the announcement of mega international events in the city, like the World Cup (2014) and the Olympic Games (2016). 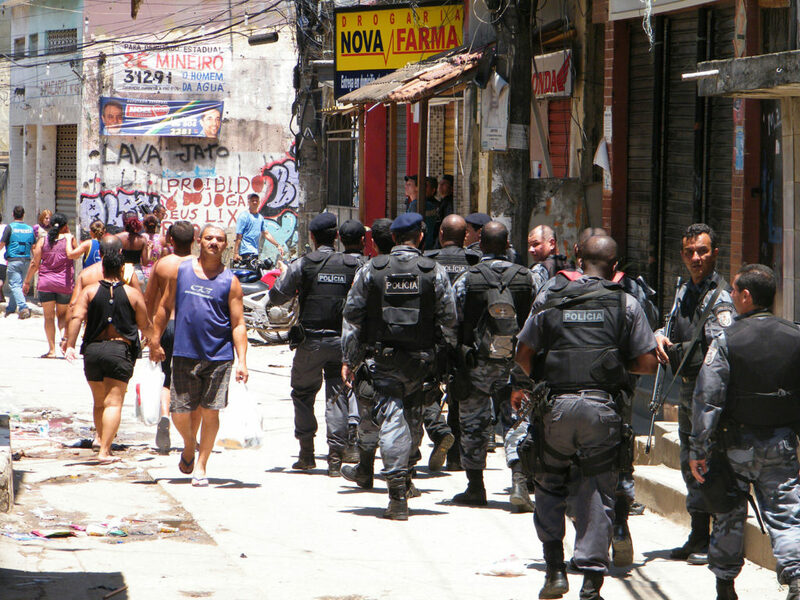 To host those events, a new apparatus of force was created, including the intensified use of the army for “the Guarantee of Law and Order (GLO)” in favelas; the creation of the Anti-Terrorism law, which now can be applied to ban social movements; and the creation of the Pacifying Police Unit (UPP), which was positioned in strategic city axes around facilities used during the 2014 World Cup and the 2016 Olympic Games. Since then, the city has also witnessed an intense increase in the military presence, which also has lead to more extra-judicial executions during police operations and paramilitary activities. Simultaneously, activists and civil society in general organized themselves to resist, using video many times to do so. In 2012, for instance, a protest in Vila Autódromo, a community evicted because of the Olympic Games, was streamed in the international meeting of Rio+20 People’s Summit. But to understand this context fully we need to go back to the iconic year of 2013, when protests popped up in hundreds of Brazilian cities, engaging millions of people of different political persuasions. At that time, Rio de Janeiro was one of the epicenters of this political earthquake. Video streamings played an important role not only of engaging people to reclaim the streets politically and creating a process of co-presence and support between the streamer and their audience, but also of producing evidence in legal courts, by sentencing or proving the innocence of activists. Many of them went to jail or were targeted by surveillance schemes or court lawsuits. After 2013, on one side, activists and human right defenders kept using live streamings widely during strikes or protests, like in the 2014 World Cup or the 2016 Olympic Games. WITNESS started the Mobil-Eyes-Us pilot in Brazil in this context, during the Rio Olympic Games in 2016, aggregating live-streamings while enriching them with further context and storytelling. However, during the period between of 2013 and 2016, the far right-wing opposition also grew quickly, utilizing an anti-corruption discourse against the Workers Party and left-wing or progressive groups in general. So, simultaneously, conservative and anti-human rights groups flourished and created their own media environment, mainly pushing for the dimission of the then president Dilma Rousseff from the Workers Party. Some left-wing activists also used streaming regularly to broadcast demonstrations leaded mainly by political parties and networks linked to traditional social movements. In terms of audience, this period was marked by a huge polarization between people anti and pro-impeachment and Dilma’s deposition in 2016 represented a victory for the right-wing groups in terms of successful mobilization. The incoming governments after 2016 and the end of the “mega events cycle” in the city amplified even more the military presence in Rio de Janeiro, instead of reversing that process. Even though the military presence is not new, as we mentioned before, military and the conservative power pushing it scaled up rapidly recently. Nowadays, Rio’s activism with video and live streaming has new challenges, especially related to the risks involved in denouncing abuses publicly. The military presence in the favelas via the GLO was augmented by a a military intervention in Rio de Janeiro between February and December 2018 by the former president Michel Temer, who was vice president during Dilma Rousseff’s administration. This means that army forces, not the elected civil governor, ruled the security forces in the state of Rio de Janeiro during that period. Paramilitary executions reached international attention with the murder of the Rio councilwoman Marielle Franco in march of 2018 – the same month when five young hip-hop activists were murdered in Maricá, both in the state of Rio de Janeiro. And at the end of the year, far-right movements, police and the military came out as the main winners in the 2018 parliament and presidential elections, with the victory of former army captain Jair Bolsonaro, an long-standing Rio politician who became famous for his anti-human rights, pro-torture and pro-military dictatorship stance. Bolsonaro used short live streamings extensively during the campaign. He did this daily on social networks during the second round of the elections, many times ignoring mainstream media and reinforcing his cultivated image of independence by talking through his own Internet channels. These live broadcasts were scheduled at about 8pm, which was almost at the same time of the main television news program in Brazil. Despite all the interactive features of video streaming in web, his streamings during the campaign were more like casual public speeches using both Youtube and Facebook, rather than using these channels to interact directly with his supporters. In one of his last speeches as a candidate, a week before the elections, Bolsonaro did a live streaming and it was reproduced in a big screen during a demonstration of his supporters in São Paulo. While he was talking about his plans to send political opposition to jail or exile, his audience could see the clothesline of his house in the background of the video. And, as his first public act after the final poll results had been released, Bolsonaro turned on his camera to give the first speech as president-elect in a live streaming (link to Facebook and Youtube) and, less than 2 hours after that, started another broadcast. It was a 5-minute live streaming. Next to his wife, Bolsonaro had a Brazilian flag stuck with duct tape on the wall as his background. That simplistic style contrasted with the impressive numbers of viewers: 3.1 million in the first 20 hours. 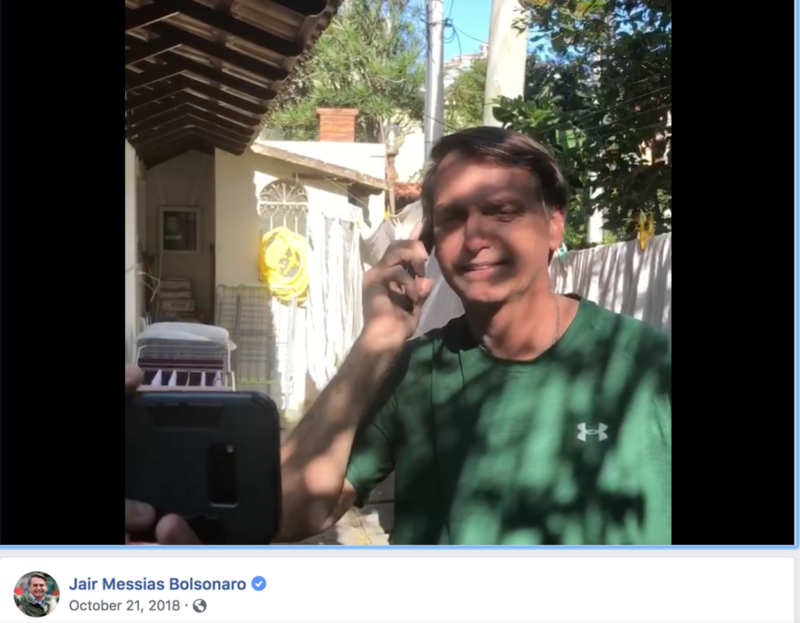 Unlike Trump, Bolsonaro as a candidate and part of the right-wing movements in Brazil didn’t use social media to cultivate a professional or high-profile image. Instead, Bolsonaro seemed proud of his amateurism during the elections. Rather, his videos seemed amateur in a professional and calculated manner. He wasn’t the only right-wing politician to use recorded and live-streamed videos effectively in this election. Some famous Youtubers from conservative groups were also elected this year to National Congress. Recently, Avaaz conducted research about the reach of the most famous of them, known as Joice Hasselmann. Their team analyzed around 10,000 Facebook posts that included fake rumours about falsely alleged frauds in the electronic voting system. They found her channels to be one of the main sources of that content. Joice has 1.9 million of followers in Facebook and more than 1 million in YouTube. Avaaz found that 71% of the interactions in her Facebook page are related to the videos posted there. Her channel in YouTube offers visitors a paid subscription for almost 3 dollars monthly, so that every week they could participate in an exclusive video chat with her and get an exclusive membership stamp on your username in the comments. During this year, Joice’s videos were used to engage her followers in her own campaign and to promote Jair Bolsonaro. Because her videos were cross-posted between two different platforms (Facebook and YouTube), it was common for Joice to ask her audience to subscribe to both channels because she had different products and approaches for each platform. A lot has been said about how disinformation via Whatsapp affected the poll results this year in Brazil or how Facebook impacted the Trump elections, but YouTube also played an important role in Brazil’s politics. While WhatsApp seems to be the place for guerrilla communication, YouTube provides more time to present ideas and strengthen a discourse around an issue. Vice recently published an article (in Portuguese) about this phenomenon in Brazil, after Bolsonaro posted suggestions of YouTube channels for his Twitter followers to subscribe to. A researcher cited in the article pointed out that right-wing activists and conservative groups use YouTube to attack and trivialize LGBTQ+, feminism, progressive groups and even basic discussions about racism. Many times, these groups use misinformation as a tactic. The Brazilian elections in 2018 had many episodes like these. Alarmist fake news around fraud being committed in the elections was spread by Bolsonaro and Joice Hasselmann as a tactic to engage their supporters. In one of the most famous videos, recording almost 2 million of views, Hasselmann gave the uppercase and sensationalist title “URGENT: USA detects actions from Hezbollah, Iran and Venezuela in brazilian elections” to a video where she showed a letter supposedly by the US Congressperson Dana Rohrabacher with few words about an allegedly interference, without providing further information. Using tactics like this, since dissatisfaction and disbelief in the status quo were the fuel to this far-right activism, they engaged their followers with the idea that they had to create a movement so wide that it would be impossible to corrupt it. Recently in Brazil, WITNESS also followed two cases of small anonymous far-right groups creating copycat Facebook pages mirroring almost the same name of grassroots activists in order to promote confusion and mimic their strategies. These right-wing groups usually engage people in an anti-human rights discourse, trying to legitimize human rights abuses or violations like extrajudicial executions. Although their audience is not so wide as the original groups, they try to create a local “counter-narrative” and intimidate human rights activists. 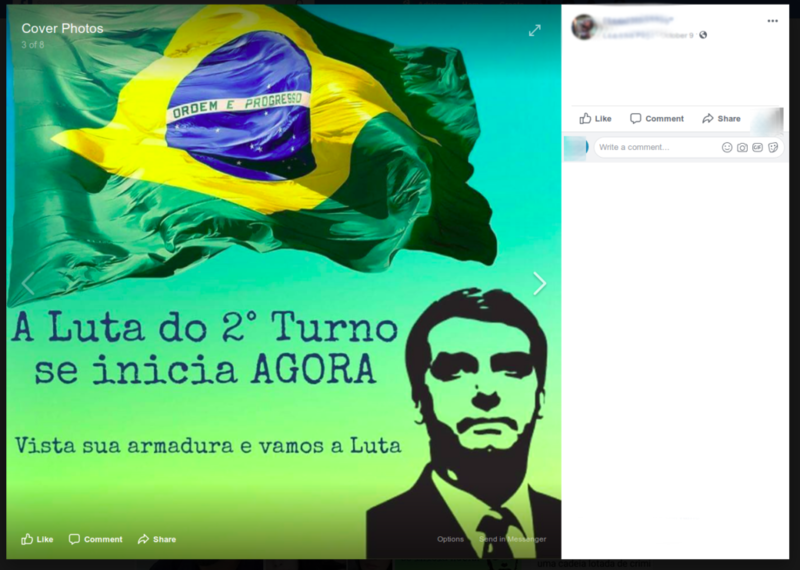 Screenshot of a post supporting Bolsonaro after the first round of 2018 elections in a copycat Facebook page which imitates a grassroot favela-based media group. “The second round fight starts NOW. Wear your armor and let’s fight”. 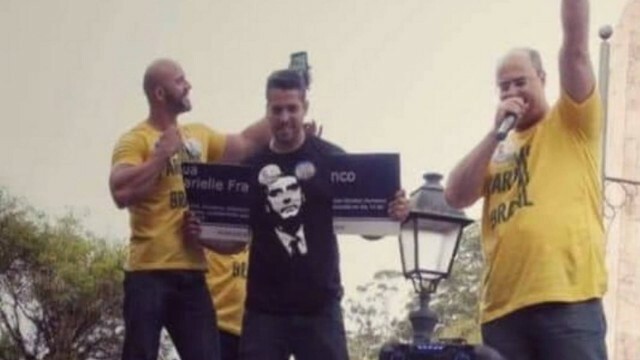 Also in the last election, in Rio de Janeiro, a then candidate (and now elected deputy) during a public speech in October 2018 (a week before the elections) broke a street sign in memory of Marielle Franco, the aforementioned human right activists murdered in 2018 (see main image above). After that, hundreds of Marielle supporters printed out again thousands of signs. In both events, live streamings from multiple sources were used to broadcast those events from multiple angles, many times using platforms like Instagram Stories. Beyond livestreaming protests or public campaigns speeches, Instagram was also flooded by memes and political campaign materials. With this new scenario, many activists in Rio de Janeiro reorganized their actions to denounce police abuse while trying to diminish the risks involved. The themes and content of their live-stream broadcasts has been changing. If in 2013 it was mainly streamings from demonstrations, in the last years, grassroots media groups have also diversified their streamings to include transmissions of public debates, cultural activities or other kind of contents. Beyond that, Rio activists also developed new strategies in favour of human rights and democracy. A worthwhile example in this area is the work done by Defezap. Defezap is an organization based in Rio de Janeiro and works as a hub where people can send videos and denounce abuses using the most popular instant messenger in Brazil,WhatsApp. Currently a WITNESS partner in the Mobil Eyes-Us project, Defezap doesn’t reveal the phone number of their sources, but does provide support to assist in a legal case if needed. From the multiple videos received, Defezap maps patterns of violence in the city while gathering together crucial evidence. WITNESS also supports video as evidence initiatives in Rio de Janeiro, such as the partnership with Papo Reto, a grassroots media channel based in Complexo do Alemão, one of the main favelas of the city. However, as we can see, live streamings and the aesthetics and strategies of amateur video are being used regularly nowadays not only by human rights or progressive groups, but also by status quo agents, army forces and conservative networks. Video streaming platforms such as Facebook and Google aren’t neutral technical platforms where discussion happens, but private profit companies with internal policies and political choices. The private policies of these companies around fake news, user privacy, content visibility algorithms or membership requirements to facilitate monetization of their channels affects democracy itself nowadays. This episode in Rio de Janeiro helps us to visualize a global reality: streamings and video activism in the web is a field occupied by different forces, and not a unique or monolithic perspective. Conservative and progressive groups develop both co-presence and audience engagement strategies. Platforms like YouTube or Facebook tried to pose themselves as neutral, but it’s undeniable they have an important role politically that they should reflect upon. So, beyond the support to alternative networks and open source platforms, video activism also needs to discuss those private policies in public, since it affects millions of people and shapes the majority of our discussions. Based on the recognition of those platforms as important political players, we need to push for more commitment to transparency, anti-authoritarian and pro-human rights initiatives, as well as asking for more open-source contributions from them. It’s part of our mission in WITNESS to reflect about those topics. You can check our website to know more about our work in themes like censorship in China, content regulation and ‘terrorist’ content in Europe, and misinformation in Whatsapp.